Aizawl FC triumphed over Churchill Brothers FC Goa at their home turf Rajiv Gandhi Stadium by an unassailable margin of 3-1. 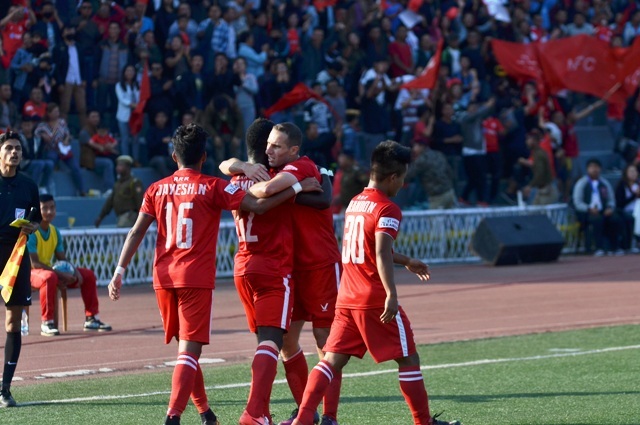 While Kromah (33′) put the visitors ahead in the first half, Lalramchullova (62′), Kamo (69′) found the net in the second half to bring Aizawl FC back in their title hunt and finally Nongkhlaw (77′) scored an own-goal much to the Red Machines’ dismay. Aizawl FC had suffered a 3-2 away defeat to Mohun Bagan in their last match and were desperately looking to bounce back in this match. Aizawl FC came out without their defender Lalruatthara who has been booked 4 times already in the league. However, the home side were boosted to have Mahmoud Al-Amna return for the game after a break, owing to an injury. In the 32nd minute, Wolfe was fouled by Zohmingliana inside the box. The away team was awarded a penalty and it was beautifully converted by Ansumana Kromah to put the Red Machines in an advantageous position. 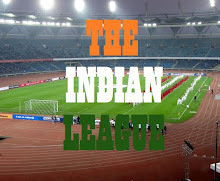 A few minutes later, Chullova took a free kick from the centre of the pitch, which was headed by Jayesh Rane towards the box. Churchill Brothers defenders managed to clear the attack before Aizawl FC boys could move in. The first half ended in a favourable position for the away team, thanks to the solitary goal scored by Kromah from the penalty spot. Though Aizawl consistently maintained their possession of the ball, they couldn’t convert the chances whichever they could create in. The second half started with Albino’s skills as a keeper being tested when Churchill winger Gabriel Fernandes kicked the ball straight towards him. Alfred Jaryan, in the 55th minute, made a spectacular shot from outside the box but it flew over the bar. In the 62nd minute, an opportunity loomed large for the home team as they were awarded a penalty. Lalramchullova took the penalty and brought a parity on the scoresheet. Aizawl FC continued to attack and thrilled the home fans yet again in the 68th minute. Jayesh Rane’s pass was received by Kamo Stephane Bayi who defeated Meldon D’Silva in a one-on-one position and went on to tap it home. Churchill Brothers made an error ten minutes later which reaffirmed their defeat when Banpynkhrawnam Nongkhlaw scored an own goal in his attempt to clear the ball in the 76th minute. The Hero of the Match went to the Aizawl FC defender Kingsley Obumneme, With this win, Aizawl FC reach to 16, at par with Mohun Bagan, playing one match extra.